Osteoporosis is characterised by loss of bone mass, bone strength, and an increased fracture risk. 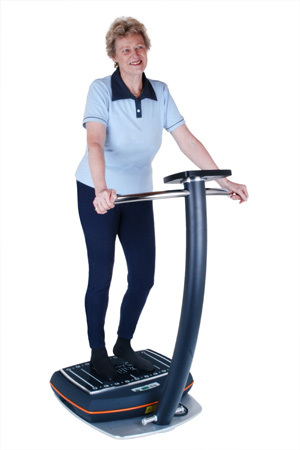 Fracture prevention in the form of successful fall-prevention is therefore the core goal of osteoporosis treatment with Galileo vibration therapy. In addition, the targeted gain of muscle force (indirect, positive effect on bone parameters) and the improvement of elasticity, flexibility and muscle function are further treatment goals. These objectives are achieved through Galileo Training at different frequencies. This concept not only allows treatment and prvention of Osteoporosis but also of Frailty, Sarcopneia and Dynapenia. With increasing age and increasing immobility, muscle power and muscle force decline. During Galileo Therpay, especially at high frequencies, the muscles that are responsible for high forces and rapid movements are stimulated and triggered to function and grow effectively. As a result muscle power and muscle force increase. As bipeds we spend about 80% of the time on one leg during walking. The critical point when walking and also when falling is to control the lateral weight shift. So when it comes to preventing falls, the decisive factor is the power of the muscles around the hip. Therefore in addition to the improvement of muscle power, ameliorating balance and proprioception in the lateral direction plays an important role in fall prevention. This goal is best achieved using low frequencies during Galileo Therapy. Improvement of elasticity, flexibility and muscle function. When a muscle is too stiff, it can not store energy adequately. Movements then lose the necessary speed and efficiency. With reduced motion efficiency, the body has to expend much more energy performing the same movement. This results in decreased muscle efficiency and decreased endurance. Without muscle elasticity there is no effective energy storage and thus no quick, powerful movements. 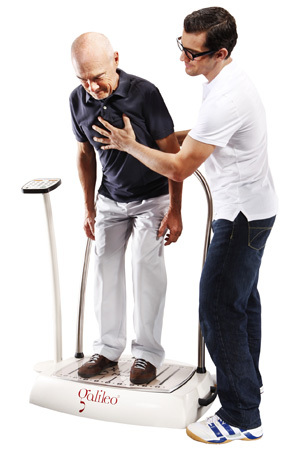 To improve elasticity, flexibility and muscle function an intermediate frequency is used during Galileo Therapy.